Yesterday I was invited to participate at a Masterclass for fashion bloggers organized by Grazia in the center of Amsterdam as part of Amsterdam Fashion Week Downtown Program. Inspiring speeches by Anna of NSMBL.nl and Sabrina of AfterDRK.nl, about their start, about inspiration, about originality, about persistency, about continuity, about strategy, about commerce but most of all about passion. Polle de Maagt informed us about how technique should work for us. He is a freelance consultant trying to change companies to be less about ads and more about acts. Also Polle was very passionated about his work. Passion is not to pass! 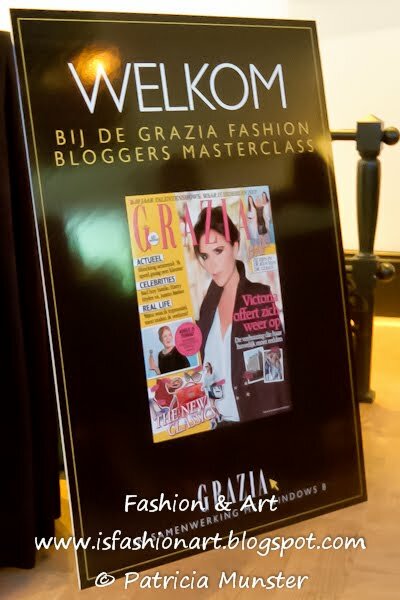 Thank you, team of Grazia, for the inspiring and passionated morning!